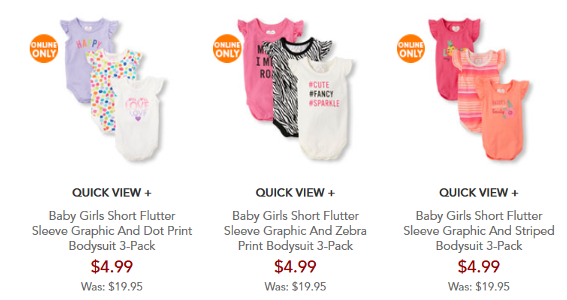 Today only, The Children’s Place has everything in their clearance section reduced to $4.99 or less, including swimwear, shoes, and lots of other awesome buys. Even better, it all ships free! Don’t forget to check the regular sections, too. They have all the play matchables for $2.99 each. You can’t beat a $6 outfit shipped right to your door. Three-piece bodysuit sets for $4.99! Flip-flops for $1.58 – both boys and girls! Swimwear for boys, girls, and toddlers for $4.99. Cool Shades for the kids for $1.98 shipped!